Air New Zealand and Singapore Airlines have announced a new partnership on the Singapore - New Zealand routes. These two already work together with their membership in Star Alliance and their ownership of shares in Virgin Australia. The new alliance will allow NZ to re-enter the AKL-SIN market replacing SQ on 5 weekly services (SQ281/282) and adding a further two to offer 7 weekly services operated by the 772ER. SQ will slowly add the A380 to their SQ285/286 service replacing the B773ER although initially this will only be seasonal with the 773 remaining in the off season. The A380 should be clear of the terminal by the time 2 of the 3 EK A380s arrive so this shouldn't cause gate issues. With the A380 replacing the B773ER their should be a capacity increase of 30% on the route. SQ will keep their SIN-CHC service as part of this partnership. NZ hasn't flown its own aircraft to SIN since 2006, with the NZ code disappearing off SQ flights in 2007. The newest airport in Queensland is well on its way to completion, with a great article appearing in the Brisbane Times today on it. 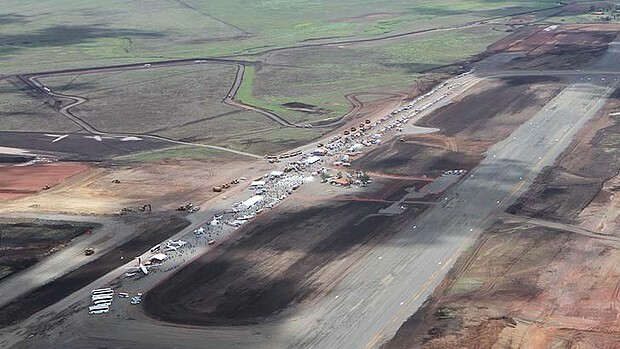 Construction of the airport which will be capable of handling aircraft up to Boeing 747 in size, only began last year and is set for completion in April before 4 months of certification then the opening. The below picture taken from the Brisbane Times article shows the development in November 2013 and also shows a "fly-in" of sorts with some Beechcraft and a Skytrans Dash 8 clearly visible in the foreground.